In 2001, C-IJBN was borne out of the shop of prolific Challenger Builder and Inspector Bruce Brown. She became the airborne pride of Ron Watson of Parry Sound, Ontario and affectionately known as "One Jelly Bean". As is the way of the Challenger family, Ron and Antonia Watson became close friends of Bruce and his wife, and C-IJBN was maintained by Bruce throughout her life. Sadly, Ron passed away, and Antonia asked Bruce to find C-IJBN a good home. Now Bruce had been out our way a few times doing inspections for builders and dropped in for visits. I think he took pity on me and the slow progress of my own build of C-ILHC, perhaps deemed us worthy of her, and sent us some information and photos of her. Kris Falk was here that night and we reviewed the initial photos of her and probably started hatching the plan in the same instant. For some unknown reason, in about 10 seconds, I decided my wife, Tracy, should have C-IJBN. Now up to this point, Tracy had never mentioned wanting to learn to fly, and I had never asked her, so I don't think either of us knew at the time why we made the decision that C-IJBN should be hers. All we knew is we took one look at her pictures, and somehow knew Tracy had to have her. And she would learn to fly. Over the next few days, as Bruce and Antonia and I firmed up arrangements, Antonia sent us some documents related to the transfer of C-IJBN, and a nice letter to us that sent shivers down our spines when we read it. In her letter, Antonia hoped Tracy and our daughters would enjoy the plane as much as she and Ron did. She also mentioned that Ron called the plane "One Jelly Bean" or "Jelly Bean" from her call letters I-JBN. Our mystery was becoming a little clearer by the minute. Our eldest daughter is now 16 and a frequent attendee of Challenger Fly-ins at Montebello. When we told our folk's that we were expecting our first baby, Tracy's Dad commented that she would be just about the size of a jelly bean at that point in time. The nickname stuck - it was good for a girl or a boy, and much better than saying "Baby" all the time. So, we called her Jelly Bean throughout Tracy's pregnancy, and she is "Jelly Bean" to all of us to this day. When she learns to fly, C-IJBN will be hers, and Tracy will build herself a new Challenger. 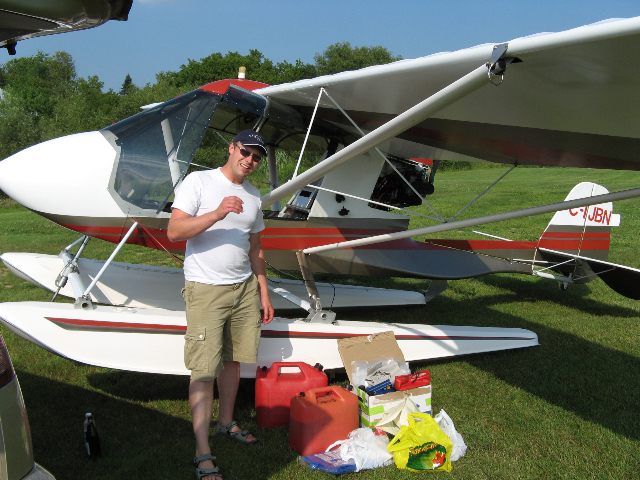 Kris told the story of his six day adventure flying C-IJBN across much of Canada in his own time over dinner to the crowd at Montebello 2007, and earned himself the Maurice Vinet award for his passion for flying. Bryan Quickmire has done a nice job assembling the core elements of the story from various emails exchanged while Kris was on the way at http://www.challenger.ca/experience_jellybean.html. Kris and Jelly Bean's journey adds to several others made in recent times across much of our great land by Challenger explorers like Doug and Denise Gagnon (Barrie, Ontario to Nanaimo,B.C. - and back!) and Larry Whittaker (Montreal, Quebec to Tugluktuk, NWT). Here are a few shots before during and after the big trip. Yep! and even 90 Lbs under gross! - Captain Falk ready for departure! Enroute - Will that be water or land, water or land. 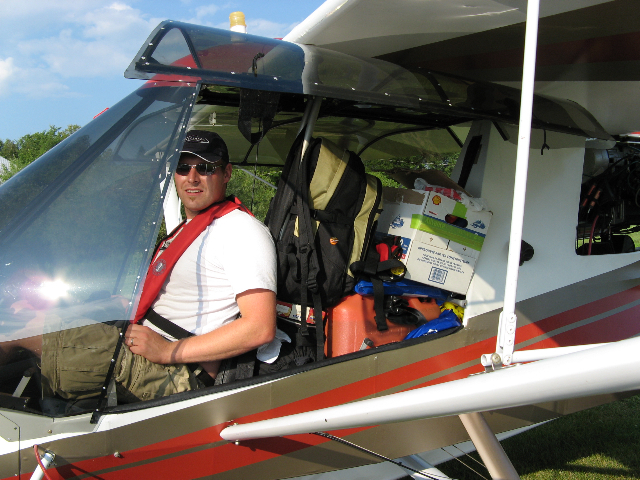 Amphibs provide an added margin of safety in northern Canada! 6 Days, 39 Air Hours, 2,500 miles!